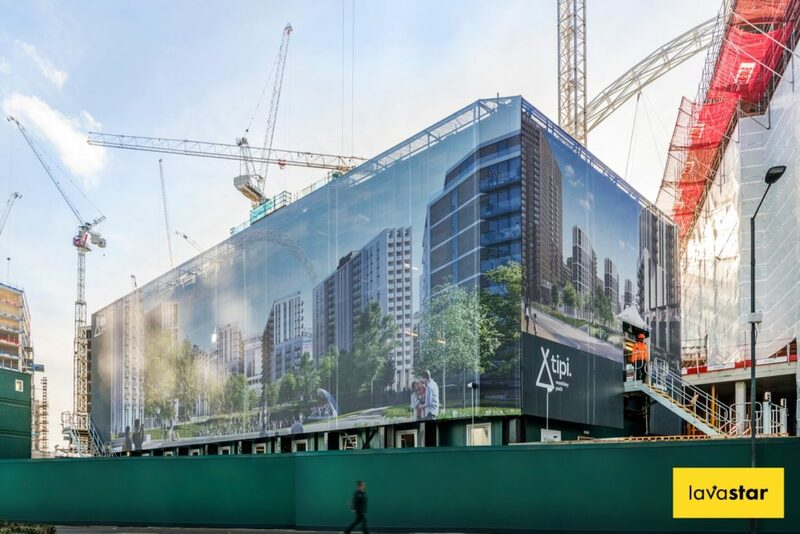 Lavastar recently completed a very impressive site cabin wrap in a high profile location in central London. 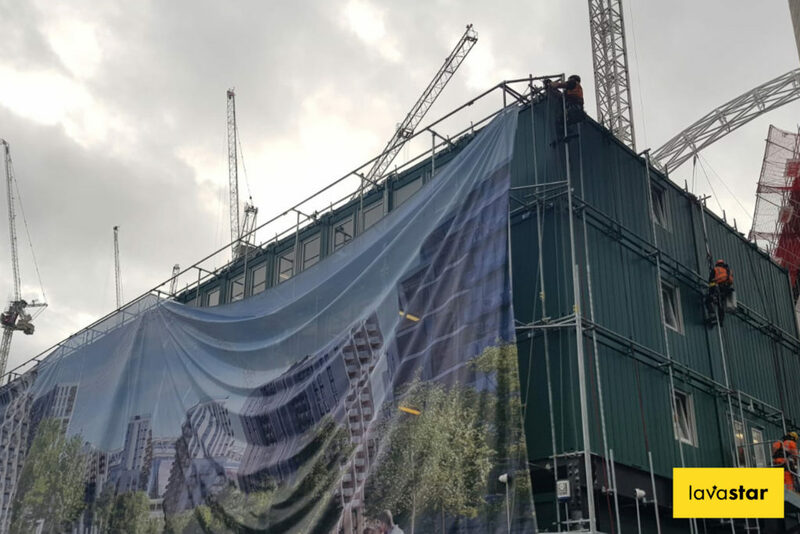 The task at hand was to wrap a large modular site building with a digitally printed banner. Lavastar had directly wrapped portakabins in printed vinyl in the past, but this was a new challenge which was accepted with open arms. 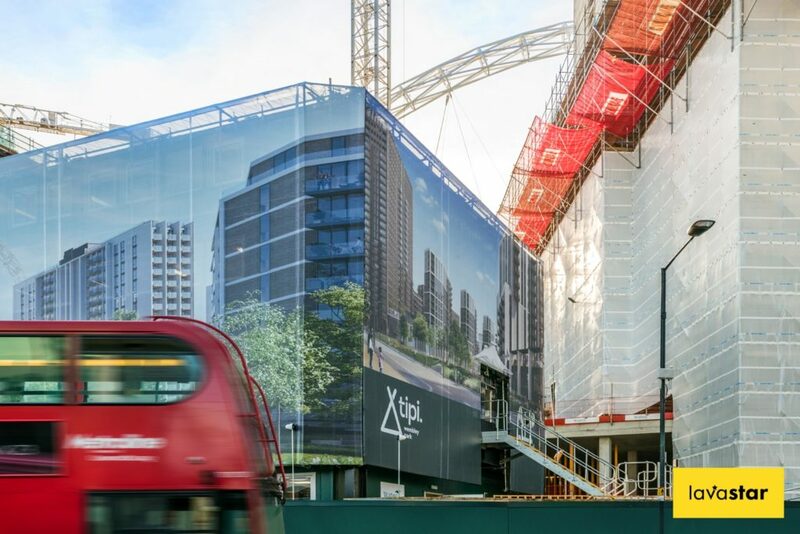 The idea of installing such a large site portakabin wrap with no existing framework might sound impossible. However, with some careful planning and a creative, forward thinking attitude, Lavastar were making swift progress from the word go. The process of installing a site cabin wrap is not too dissimilar to that of a scaffolding wrap. The key difference being that instead of extending the existing scaffold to house the banner, a whole new purpose built framework must be installed. We began building this framework by bolting bespoke feet onto site cabins themselves. A key clamp frame system was then built up from these feet and met by more supports at roof level. This framework created a flat façade for the banner to be stretched over and allowed the banner to sit away from the building for a sleek, uniform finish. 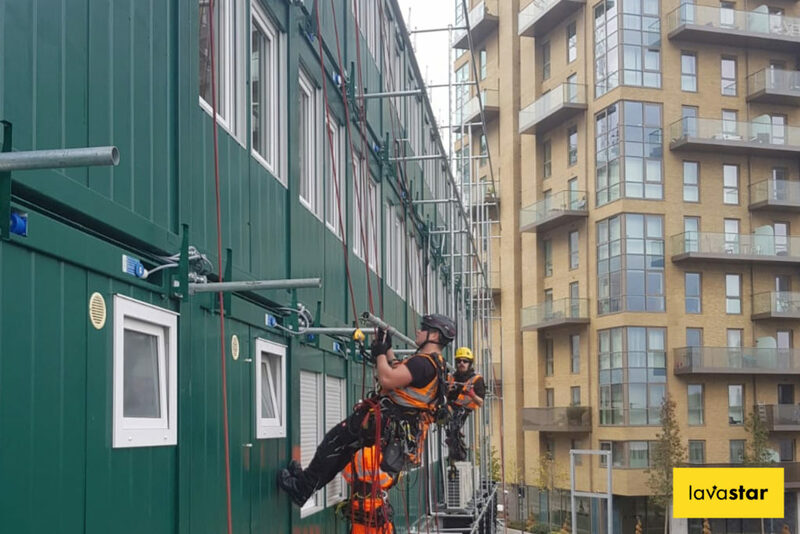 Once the framework was erected, Lavastar instructed a third party expert to carry out a number of pull tests on the framework. These tests served to ensure that once the banner was in place, the structure would be able to withstand any strong winds it might encounter. As well as carry out these precautionary tests, Lavastar also provided detailed wind calculations, backed up by technical wind loading diagrams. This saw that all health and safety regulations were not only met, but superseded. A decision was made early on in the project to opt for a mesh banner for this printed site cabin wrap. This was largely down to the importance of preserving the flow of natural light through the banner into the site offices. Another key factor was that when compared with a solid banner, a mesh banner greatly reduces the risk of any wind loading issues. This early decision allowed us to begin producing the banner in house right from the get go. At Lavastar we are blessed with our own team of graphic designers and printers working alongside one another under the same roof. This arrangement greatly reduces lead times and also minimises the risk of any errors thanks to such a strong communication link and shared experience. Installation of the portakabin wrap was smooth and efficient thanks to the thoughtful planning which preceded it. The result was a beautiful, printed cabin wrap which served to improve the sites presentation, provide a huge boost for the sites promotion and portray the professional and attentive attitude of our client. You can view more photographs of the finished product in our gallery, or get in touch to start working towards your very own.